If there is going to be any effort to revise the nuclear deal with Iran, it might grow out of the work of our next guest. Brian Hook is senior adviser to the secretary of state and head of policy planning at the State Department. He's been talking with European diplomats. Knowing that President Trump regularly attacks the nuclear deal with Iran, they have been discussing alternatives as a deadline approaches May 12. Brian Hook is in our studios. BRIAN HOOK: Good morning, Steve. INSKEEP: Thanks for coming by. What are you trying to do? 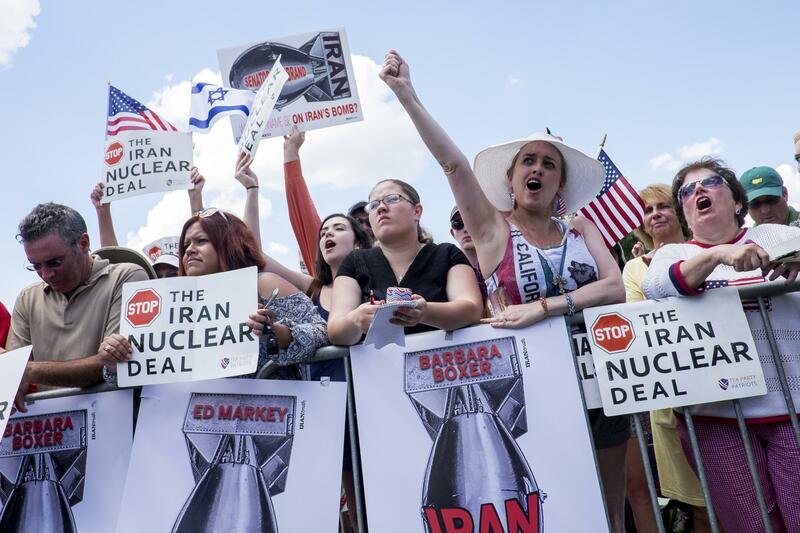 HOOK: What we are trying to do is to address the deficiencies of the Iran nuclear deal. And over the last few months, we have been working pretty diligently with the British, the French and the Germans on achieving a supplemental agreement that the president has requested that would address a lot of the problems that we have with the existing deal. INSKEEP: Supplemental agreement meaning, keep the Iran nuclear deal in place, but see if you can do another deal or do something else. HOOK: Yeah. The president has described it as a supplemental agreement. And if you look at the history of arms control, it's very common for one deal to then be improved upon or supplanted by another deal. And so what we're asking for has a lot of precedent historically. We're talking about Iran's nuclear program. They have a history of hiding its nuclear program from the world. And we think the JCPOA doesn't go far enough to address the concerns we have with Iran's nuclear program. And we have to have a new deal. INSKEEP: JCPOA - that's the jargon for this nuclear agreement. I want to play a little bit of tape of President Trump yesterday. He's with the French president, Emmanuel Macron, who's in the middle of all of this. And he alluded to this May 12 deadline that he faces to extend or not extend the sanctions relief for Iran. PRESIDENT DONALD TRUMP: But there is a chance. And nobody knows what I'm going to do on the 12 - although, Mr. President, you have a pretty good idea - but we'll see. But we'll see also, if I do what some people expect, whether or not it will be possible to do a new deal with solid foundations. INSKEEP: Brian Hook, do you have a pretty good idea of what the president intends to do on May 12? HOOK: Well, as the president said, he hasn't made a decision yet. He and President Macron had a very good discussion yesterday. They discussed paving the way for a new agreement that would cover a broad range of concerns about Iran. I think the U.S. and France understand each other better on the need to take a stronger approach than has been taken in the past. So I think there is an opportunity for a new approach. But a lot of work remains to be done. It's too early to tell if we'll be able to reach an agreement with the Europeans. We still have some gaps to close. INSKEEP: Oh, so you don't even have a full agreement on the side of the outside powers, never mind Iran. HOOK: No. We have been working very well with the Europeans to try to get a supplemental agreement. But we have not reached that yet. INSKEEP: And what you want is nuclear restrictions that last longer than this deal. You want restrictions on Iran's ballistic missiles. Are there other ideas that you have out there? HOOK: Well, right now, this plan - this JCPOA imposes limits on Iran's nuclear program. Those limits expire around 2025. HOOK: So we want to extend those limits. And we also want to address Iran's intercontinental ballistic missile program. And we need to deter Iran from its adventurism in the Middle East, which has destabilize the region. INSKEEP: OK. So I'm reminded of that military saying that in war, the enemy gets a vote. You have your plan, but the enemy is going to do what they're going to do. I suppose, in a negotiation, you have to remember there's another party. In this case, it's Iran. And we had an interview on the program yesterday with Javad Zarif, the foreign minister of Iran. And I asked him a question about the very things that you're laying out, the idea of an extra agreement. I said, if you guys aren't going for a bomb and you say you don't want a nuclear bomb ever, why not sign onto added safeguards? And here's something of what he said about the terms. MOHAMMAD JAVAD ZARIF: They were the subject of two years of negotiations. And now for the United States to come back and say, we need more. That would be violating the foundations of the agreement. INSKEEP: But why do you care if you're not planning a weapon? JAVAD ZARIF: Because our nuclear program was never intended to produce nuclear weapons. INSKEEP: Never intended to produce nuclear weapons. He says this was a negotiation. This was the final terms. Why should the United States go back on its word? That's his question. HOOK: Well, Foreign Minister Zarif is incorrect when he says this is an agreement. I was in a meeting with him in September on the margins of the U.N. General Assembly, where he said the JCPOA is not an agreement. The parties could not agree on an agreement. INSKEEP: On calling it an agreement. HOOK: That's why it's called a plan of action. So this JCPOA is not a treaty. It's not an executive agreement. It has no signatures. It has no legal status. It is a political commitment by an administration that's no longer in office. INSKEEP: Nevertheless, the United States and Iran and other countries sat down and, in a very public and relatively formal way, all seemed to agree to do certain things, even if it wasn't formally a treaty or an agreement. HOOK: Well, it has this weak status because it has a number of deficiencies. And it did not have the votes in the Senate to make it something permanent and enduring. So what we are trying to do is work with the Congress and work with our European allies to address the deficiencies. INSKEEP: So presuming that you negotiate something with Iran rather than try to impose something on Iran, it would have to be a trade. The old agreement, or whatever we want to call it, was a trade. Iran got sanctions relief and allowed limitations on its nuclear program. As you think about trying to get more restrictions - more limitations on Iran, are you or the European allies prepared to give anything in return? And if so, what is it? HOOK: If you look at the history prior to the JCPOA, Iran was not a party to those negotiations. The U.N. Security Council and a coalition of countries around the world imposed a range of sanctions on Iran because the IAEA could not declare that its nuclear program was peaceful. And so there was at least 10 years of sanctions imposed on Iran. That was not - Iran was not a party to those discussions. INSKEEP: Are you saying, then, that you're not offering Iran anything here - you're going to push them? HOOK: I think what the president has asked for is a supplemental agreement to the Iran deal with our European allies to allow us, the United States, to stay in the deal. And we're not there yet, but we've made some progress. INSKEEP: How seriously have you thought about the possibility that this deal falls apart and that Iran begins bracing for a bomb, something that they say - and, by the way, secretary of state nominee Mike Pompeo has said - that they haven't done in the past? HOOK: Well, if Iran were to restart its nuclear program, it would create a much bigger set of problems for them than they face now. And so we are focused very much on the diplomatic aspects of this. And that will be our focus until the May 12 deadline that the president has set. INSKEEP: But, in a few seconds, you're aware of the risks here? HOOK: We have been working on contingency planning for the last couple of months in the event that we're not able to reach an agreement with our European allies. INSKEEP: Contingency planning meaning, like, ready for a military strike, or what do you mean? INSKEEP: What would you have to do next? OK.
INSKEEP: Brian Hook, thanks for coming by. Really appreciate it. INSKEEP: He's a senior official at the U.S. State Department. Transcript provided by NPR, Copyright NPR.